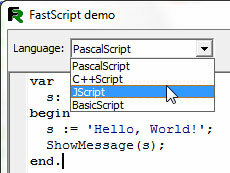 FastScript is cross-platform multi-language scripting engine. It is useful for the programmers who want to add scripting ability to their projects. FastScript is written on 100% Object Pascal and can be installed in Borland Delphi 4-7, C++Builder 4-6 and Kylix 1-3. Unique feature of FastScript is ability to use several languages (PascalScript, C++Script, JScript and BasicScript), so you can write scripts using your favourite language. FastScript doesn't use Microsoft Scripting Host, so it can be used in Windows and Linux environment. It is possible to add a new language - language definition is stored in the XML format, so you can perform it without writing a Delphi code. FastScript combines cross-platform scripting, fast code execution, small footprint, rich set of features and a splendid scalability. Make your applications the most flexible and powerful ones with FastScript!